So some things have happened since my last update in June. I know it has been a while since my last post but things get busy here during the summer and some things get forgotten. Now that I am concentrated again on getting stuff happening in the store, updates and new posts will be happening regularly. We had our PPTQ event for the quarter and things went great for us. People used the event page to sign up for the event which really helps us out in not only testing the events page but helping us estimate our attendance needs for the event. I want to thank those of you that came and congratulate the winner of the event. Good luck to you in the upcoming regionals play. We scheduled our next PPTQ event already for next quarter. It's going to be October 15th, a couple of weeks after Kaladesh releases. I will have the event created shortly after this post goes up. It will be a sealed event again and we hoping to hit our 32 player event for the year. In order to do so we are adding some incentives to our other events in order draw more interest to the PPTQ. Winners of each Game Day, Prerelease, and Launch Event for a new expansion will get a free entry into the next PPTQ. Also those that Top 8 each of those events will get a $5 off coupon for the next PPTQ (excluding the winner). These entries and coupons are not transferable and cannot be accumulated (can't earn more than one for each quarter). 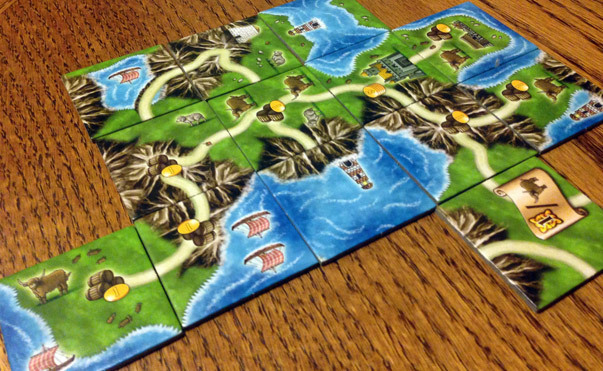 Isle of Skye is similar to the tile laying of Carcassonne but has a great deal of depth in the interaction of purchasing tiles from other players to add to your territory. Speaking of Magic events we have the Eldritch Moon Game Day coming this Saturday. Event times are on the events page and entry is free for everyone. Just bring a standard Magic deck to play with. If not you can always pick up one of the latest intro decks and play. We'll have promos for everyone that plays and the winner will walk away with the champion playmat with artwork of the new Liliana. Prereleases for the new expansion, Kaladesh, coming is September have been scheduled. Event listings for them will also be up later today in case you wish to sign up now. Our board game nights have become a hit again and I want to thank all of you that have shown up the last couple of weeks. I've been having a great time at these events and I hope you have been as well. This week, August 11th, we are playing the tile laying strategy game Isle of Skye from Mayfair Games. You play as a new lord in the isles of Skye expanding your clan territory by purchasing new tiles, sometimes from other players. It won the Kennerspiel Des Jahres award this year, the Euro Strategy Game of the Year award.